You won't accomplish Christian debt reduction without a good plan. We've already discussed Christian debt solutions. Depending on how you followed the links, you may also have read about Christian debt consolidation, and Christian consumer credit counseling. But all of that won't do you any good unless you choose a debt reduction plan and stick with it. Your Christian debt reduction plan will probably include a few things. It may include debt consolidation. When people have more than one debt – especially more than one credit card – debt consolidation usually makes sense. Read this page if you think you need a Christian debt consolidation service. One reason you might not want to consolidate your debt is that there is a cool little feature in Mvelopes (discussed below). It allows you to designate certain monthly amounts to each debt – spending the most on the debt with the highest interest rate. When that bill gets paid, the money you were spending on that bill rolls down to the next bill so that now you have more cash to put toward that bill. When that debt is repaid the money you were using for it rolls down and is added to the next debt. In this way, you can pay off your debts quicker. However, if you have high debt interest rates (like most credit cards), I still recommend that you consolidate your debt into one payment. This will directly impact your Christian debt reduction plan. Your debt reduction plan will include some type of counsel. Read this page if you have yet to find some good counsel. Your Christian debt reduction plan will include a practical budget plan. It doesn't matter how much money you make. If you don't plan where and when you will use it, you will have no control over your finances. That’s what this page is all about. It wasn't long ago that people used a very simple form of spending control. They took ordinary envelopes and wrote an expense category on each one. They might have been utility bills, savings, church giving, insurance, groceries, etc. In addition to bills that are constant each month, they also created envelopes for things like vacations, college tuition, birthday and Christmas gifts, etc. When they were paid by their employer, they took the money and divided it up among the envelopes according to how much each category needed for the month. When it was time to pay a bill or go grocery shopping, they took the appropriate envelope and used the money inside to pay for goods or services. If in a given month they had an unexpected bill, they simply chose to transfer some money out of one envelope – vacation for instance – and put it in the envelope that needed the extra money. If they didn’t have money for it – they didn’t buy it. They couldn’t. There was no such thing as credit cards. That's the idea behind Mvelopes . But with Mvelopes, you don’t use common envelopes. You divide up your money digitally. Your Christian debt reduction plan is all put securely on the web. You start by going through a setup process where you define your income and assign needed money to each "envelope." You then create links directly to your bank accounts (checking and savings) so that Mvelopes can automatically track all your expenditures and withdrawals. 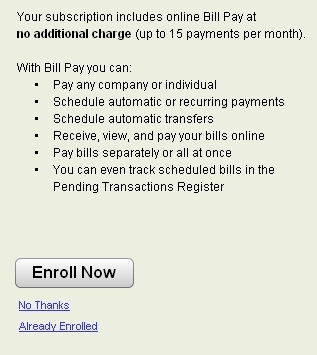 As you go further into the setup process, you can setup automatic online bill payments. This allows you to have up to 15 monthly bills that get paid automatically – when and how much you determine ahead of time. Once setup is complete you will arrive at the home page. This page gives a summary of all your envelopes. The menu allows you to do several things. You can work on your budget – determining how much money goes into each envelope. You can setup automatic bill payments. The "Fund" function allows you to move money around to get the right funds in the right envelope. The Debt Center is a really cool feature. You first list all your debts: credit cards, car loans, mortgage, student loan, etc. Enter the current unpaid balance. Add the interest rate and then the amount you will be paying each month. 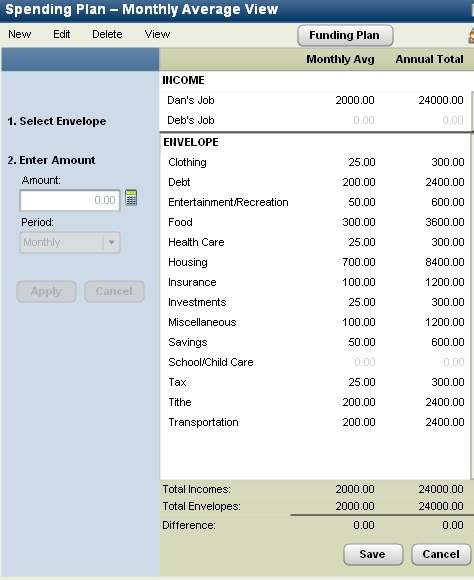 Once you’ve added the information, the program automatically calculates what month and year you will pay off the bill. It automatically prioritizes the highest interest bill so that the most money goes to that bill. Typically when we pay off a debt we then use the money we were putting toward that debt as “extra” money. But what Mvelopes does is have you add the “extra” cash to the next debt. Say your highest-interest debt has a balance of $500. You have decided that you will pay $50 a month toward this bill. After about ten months you will have paid that debt in full. Now comes what Mvelopes calls rollover. Rollover is a feature that automatically takes that $50 that you were using to pay the now-paid off debt and adds it to the payment you are making to the next debt. So if you were paying $25 a month to credit card number two, you will now have an extra $50 to add to your repayment. Now you are sending $75 a month. Doing this, you will pay off your debts much more quickly. Once you have your spending and Christian debt reduction plan set up, you can get ready to go mobile. Mvelopes allows you to use your mobile device to manage your expenses. So you buy groceries. You don’t have to wait till you are home to assign that transaction to an envelope. Just take out your phone, have Mvelopes get your bank transaction information, and then assign that expenditure to the groceries envelope. You can check envelope balances or transfer money from one envelope to another. All while on the go. There is a learning curve. You won’t just open the software and know immediately what to do. It is easy to learn, but you will have to learn. To help you along, there are six video presentations that discuss the basics of Mvelopes . In addition, there is both email and live chat support any time during weekdays. Why should you use Mvelopes? There is a free trial – you have nothing to lose! Mvelopes is the perfect way to avoid taking on more debt. You can work on your budget anywhere you can use your mobile phone. You will keep close track of all your debts. Additionally, you are put into a process whereby you will eliminate your debt well ahead of what you thought possible. Mvelopes was created by Crown Ministries – a name you can trust. Start your Christian debt reduction plan today. Sign up for a free trial . Through with Christian debt reduction? Return to our main page, Christian debt solutions.